Still trapped in how to split pdf by pdf bookmark on Windows platforms? This article would like to tell you a great way to split pdf by pdf bookmark through PDF Split-Merge. PDF Split-Merge, which is a professional GUI application for Windows users, can be used to split pdf or merge pdf directly, conveniently and variously according to your requirements. There is one sentence which is that it is easier said than done, so here I could offer you a free PDF Split0-Merge for your trial, if you are interested in this software, just click at here, then trial version of PDF Split-Merge could be yours! 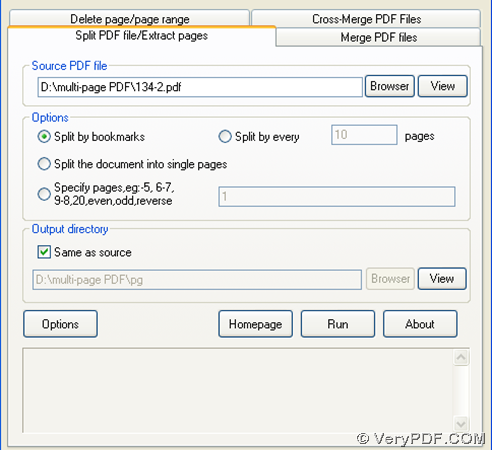 Wanna learn how to use PDF Split-Merge to split pdf by pdf bookmark? Please read the following paragraphs. 4. Click on Run, along with the finish of processing information at the bottom of GUI interface of PDF Split-Merge, your multiple pdf files could be added into objective folder automatically! Here, do you meet some troubles during process to split pdf by pdf bookmark with PDF Split-Merge by yourself? If there is, please feel free to contact us through support@verypdf.com or just drop your comment here, we will give you a fast response as you wish! Also our company could provide you with another software to help you split pdf by other ways, more information you need to know could be found at PDF Content Splitter. This entry was posted in PDF Split-Merge and tagged merge PDF, pdf bookmark, split PDF. Bookmark the permalink.